Norfolk County Register of Deeds William P. O’Donnell and his outreach team held office hours this past Thursday, May 24th at the Franklin Municipal Building. The Registry of Deeds is the principal office for real property records in Norfolk County cataloguing and housing more than 6 million land documents dating back to 1793. O’Donnell and his staff met with local residents and answered questions including the importance of filing a mortgage discharge in a timely manner. Another topic addressed was the Homestead Act which provides limited protection against the forced sale of a homeowner’s primary residence to satisfy unsecured debt up to $500,000. 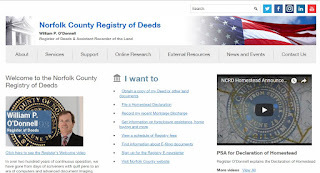 The Norfolk County Registry of Deeds is located at 649 High Street in Dedham. The Registry is a resource for homeowners, title examiners, mortgage lenders, municipalities and others with a need for secure, accurate, accessible land record information. All land record research information can be found on the Registry’s website www.norfolkdeeds.org.